This is an intricate high grade TITANIUM 6ALV-ELI (Grade 23) IMPLANT GRADE star flower design with a cubic zirconia jewel in the center. 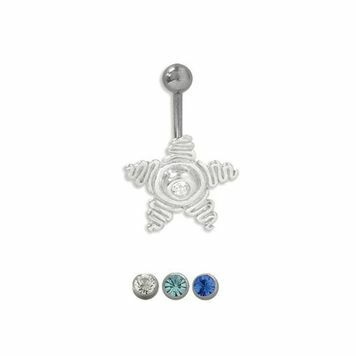 This belly ring is 14 gauge and measures 10mm-3/8 inches. The top bead size is 5mm. Titanium navel rings are lightweight, corrosion resistant, and less likely to react with bodily fluids! For extra safety your titanium body jewelry can be sterilized in an autoclave.